Roberto Quijandria was born in Ica, Peru and has worked with horses all his life. He has been the master trainer of the Peruvian Horses of La Estancia Alegre in Alcalde, NM since 1996. Over the course of many years, Roberto has developed his own method of working with horses from the day they are born. This video shares Roberto’s knowledge from the just born foal through the first saddle. His unique techniques feature the best of modern American horsemanship integrated with traditional Peruvian training. Some of the topics covered in this DVD are: handling the newborn, haltering and leading, trailer loading, picking up the feet and trimming and round pen work. It is narrated by Roberto himself. choice of a Spanish language track. Price: $59.95 plus 5.75 s/h. 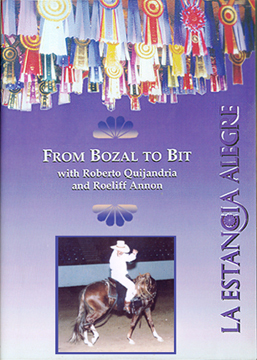 All three DVDs presented below have been produced at La Estancia Alegre in New Mexico with the contributions of expert horse trainers Roberto Quijandria and Roeliff Annon. The training techniques and guidelines shown in these DVDs easily apply to all breeds of horses, specially if a finely tuned saddle horse is the goal. 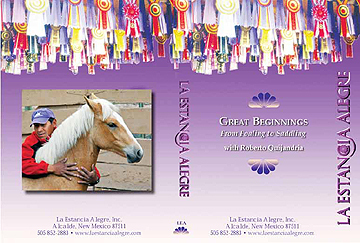 The Peruvian Paso horses and facilities shown in these DVDs are by courtesy of La Estancia Alegre. 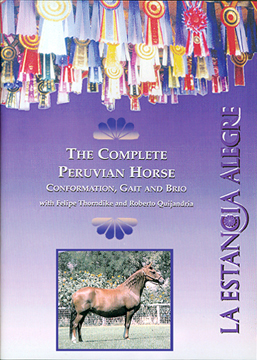 Sr. Felipe Thorndike has generously contributed his expertise as judge to this presentation of the Peruvian Paso horse. - A short introduction to the history and origin of the Peruvian Paso horse and a review of the breeder's goals and selection criteria. - The selection for and importance of the natural gait. Many different forms of the Peruvian Paso horses' gaits are presented with actual horses being ridden. -Breed standards and ideal conformation for best performance and strength are being discussed with many Peruvian Paso horses being shown as examples and to compare against standards. - Presentation, analysis and discussion of the importance of good temperament and brio for the best performance of the Peruvian Paso horse. Terms such as "brio" and "pisos" are explained. - Sr. Felipe Thorndike ranks a number of horses shown against each another according to breed standards and show criteria. You learn how to see different traits, good and less acceptable. - A discussion and presentation of different tack used in the training steps. From halter to bozal, four reins and bit. - Mounting and control of the "green" horse and first training exercises. Proper use and balance of the bozal and initial "doubling". - Beginning movements such as circling and moving the hindquarters. The importance of "release". Teaching to walk and turn. - Exceptional presentation of detail training steps to arrive at neck reining in the bozal. Keeping the horse relaxed in loose reins from walk to paso llano. - Training in 4-reins and transition to the finished horse in the bit. - Discussion on the use of Gamarilla and Bozalillo as training aids. - Asking the horse to perform all learned steps and movements in the Paso Llano (slow) gait and slow conditioning of the horse. $45.00 plus $5.75 for s/h.